One of Ryan’s early social studies assignments this school year required him to write a brief essay about the upcoming presidential election. His first effort produced a paragraph in which he declared he would not vote if he had the opportunity because waiting in lines is stupid. I believe in my kids’ right to express themselves. I also know that for Ryan, waiting is more than just an inconvenience. However, in this case, I’m glad that Veronica encouraged him to reconsider his stance. Ryan wants very much to do well in school and was ultimately swayed by the argument that his first effort would probably not result in a good grade and would give his social studies teacher the impression that Ryan was not a serious student. So he rewrote the assignment, ultimately producing a paragraph about the importance of exercising one’s right to vote. This led to a brief discussion of the election. Ryan doesn’t normally express much interest in politics or any current events for that matter, but we try to encourage discussion whenever the opportunity presents, if for no other reason than to help him fit in socially. This particular discussion didn’t get far. But Ryan did have one thought to offer about the election. “I bet I know who Tim Thomas is voting for,” he said, somewhat out of the blue. “Who?” we asked — even though we knew the answer. Some background: Tim Thomas plays goalie for the Boston Bruins. In the 2010-11 season he led the Bruins to their first Stanley Cup since the 1970s. He was named playoff MVP. He appeared in a Discover Card commercial with “Peggy.” It was good to be Tim Thomas. When it came time for the Bruins to take their traditional champions’ visit to the White House, Thomas declined, citing his opposition to the current administration’s policies. It made national headlines. We discussed Thomas’s decision plenty in our house. We used it as an opportunity to talk to Ryan about different political opinions as well as freedom of expression and respect for the office of the presidency. Ryan weighed the merits and decided he didn’t agree with Thomas. Ryan brought it up every time we saw the Bruins play the rest of the season. He thought it was hilarious that a bunch of Capitals fans sitting right behind Thomas’s net during a Boston visit to Washington wore exaggerated Barack Obama masks. We haven’t discussed Thomas in months. But Ryan’s proclamation is proof, once again, that he understands more than we realize and that he forgets nothing. That’s my son, understanding the world one topic at a time through the prism of hockey. P.S. 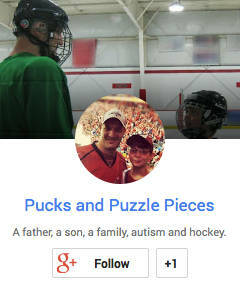 This is my 100th post on Pucks and Puzzle Pieces. Thanks for reading, commenting, sharing. I feel much more connected to the autism community since starting this blog back in January. Congratulations on sticking with it for 100 posts – most people quit after 10! Not only that, but each post is better than the last – well done! Thanks, Keith. The next challenge is to become a five-day a week writer instead of my current three. So happy that your milestone post featured a Boston Bruin! Now we just need the Bruins – and every other team – back on the ice. My guess is his love of a good chicken patty would trump any social stance on the issue. But, if we were stuck in an airport, on a Sunday, and CFA was closed? That could changes things. I can’t tell you how much your blog has helped me understand and feel more a part of your family. I secretly hope that the rest of the family read you, too. But are not posting. Congrats! Have heard similar sentiments from others in the family as well, although they’re not as comfortable posting comments.